When is the best Time for Pre-emergents? Timing is everything with Pre-emergent weed control. In northern Arizona there are 2 critical times for pre-emergent applications, spring and summer. Weeds will start their germination processes once the ground temperature is 50 degrees and above and with moderate precipitation. March and April are idea for applying to rock mulched landscapes; April and May are perfect for turf pre-emergent once the sprinkler system has been energized and one more application in early summer, when timed with monsoons for warm season weeds. Contact our vegetation management specialist here! How do pre-emergent applications work? At Morning Dew Landscaping we have documented weed species that are common in specific areas of northern and central Arizona. This allows us to use the correct herbicide for the weeds in the seed bank of those areas, unlike other companies who may just use one type for all locations. Pre-emergents work by creating a barrier that once a sprouting seed comes in contact, the herbicide it inhibits root and shoot development. When timed with precipitation, the herbicide can work into the top few inches of soil to provide better control. Most applications will provide 3-4 months of coverage. Q: Will the pre-emergent affect existing plants? Pre-emergent will not affect established perennials or bulbs. Our applicators are certified! Certified applicators understand calibration, plant ID and how to read the SDS to ensure all applications are done right the first time. 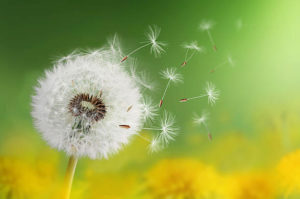 Dandelions were introduced to North America in the 1600’s. While it’s considered a nuisance now, its original purpose was for food and medicine.